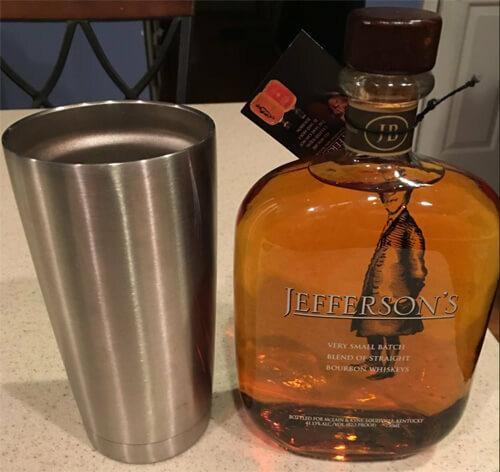 I was excited to try this Jefferson “Very small batch” whiskey when I found it on the shelf at the spirits shop by my dad’s house. My local re seller doesn’t carry it, so I grabbed a bottle while I could. I think my expectations were actually set a little too high by the bottle and the other reviews of read of Jefferson. I was expecting light char notes with a clean finish. What I got instead was smacked in the palate with char and a strong, borderline too much earthy wood taste. Overall I did drink half the bottle, but I don’t think I’ll be buying another bottle of Jefferson unless I see it on sale and want to put something on the shelf for my buddies to drink when they come over that won’t cost me an arm and a leg. Overall I”m giving Jefferson a 60/100. Let me know if you agree or disagree. Decent bottle to share with a few buddies that won’t break the bank. For a bottle that says it was aged in “slightly” charred barrels the char really comes out – at least to me.